Mayapán is located in north-central Yucatán (ca. 120 km southwest of Chich’en Itza) and was the capital of the northern Late Postclassic Maya (Masson et al. 2002; Milbrath and Peraza 2003). The sociopolitical geography is described above and will not be repeated here. Sections of Mayapán (eastern and southern) have a distinctive set of material culture that may represent the presence of the Xiw and/or Kowoj: temple assemblages, red decorated pottery on a light-colored clay paste (especially Mama Red and Pele Polychrome) (Smith 1971), and pottery that most likely came from the central Petén lakes region (excavated by Masson’s Economic Foundations of Mayapán project). In addition to the redwares at Mayapán, this site has the majority of the Chen Mul Modeled effigy incensarios thus far excavated and was likely the focus of manufacture and trade of those incensarios. 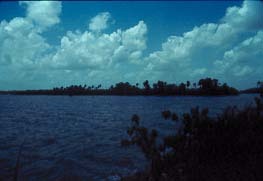 Kiuic is located in the current Kaxil Kiuic Biocultural Reserve in the southern Bolonchen District of Yucatán. This site has construction activity from the Middle Preclassic to the Late Classic periods and is noteworthy for the high frequency of vaulted architecture at the site center as well as the surrounding hilltop groups (Ringle et al. 2003). Groupo Yaché is the focus of the site center and has the largest pyramid at the site (Ringle et al. 2005). “The presence of this mound, together with the long hall N101E1015, ramps, and other vaulted buildings arranged around a rectangular or frequently subrectangular plaza identifies it as an architectural grouping we call the Early Puuc Civic Complex (EPCC)” that is found at many sites in the surrounding area (Ringle et al. 2005: 38). The site was abandoned the site by A.D. 800(Vergano 2010); however, Postclassic Chen Mul incensario fragments were excavated from the top of the Yaché group pyramid suggesting that the site remained a pilgrimage location for some time after its abandonment. Santa Rita Corozal is located in the Chetumal Bay vicinity of northern Belize. 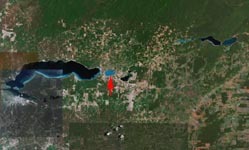 Occupation at Santa Rita Corozal spans the Preclassic to the Historic periods (D. Chase 1985) with a large population during the Postclassic period. During the Postclassic, Santa Rita may have served as a political center (Masson 2003:274). The Postclassic construction at the site (structures and altars) and the mural tradition suggest some affinity to the symbol set at Mayapán and to other 9 architectural complexes at sites on the coast of Belize (D. Chase 1985:114, 1988; Gann 1900, 1918; Miller 1982; Sanders 1960). Effigy incensarios similar to Chen Mul Modeled type (Kol Modeled) are found smashed (in pairs) on buildings in patterns suggesting wayeb’ and/or k’atun cycle rituals (Chase 1984, 1988). In association with a number of the incensarios are redware long-necked jars and tripod bowls (Rita Red and Kisim Polychrome, among others) (Chase 1984:20-22). The pastes are reddish-yellow to light brown with calcite and hematite inclusions. number of effigy incensarios (Kol Modeled) that are similar to those at Mayapán, Santa Rita, and Zacpetén. Mayapán-like effigy incensarios were also excavated from Postclassic structures. Paste ware and a small amount of Clemencia Cream Paste ware. The forms include flat-bottomed tripod dishes and collared bowls, with the majority of incised decorations reptilian in nature (Rice 1987). Zacpetén, on a peninsula in Lake Salpetén, was occupied from the Middle Preclassic to the Historic period (Pugh 2001a, 2004; Rice et al. 1998; Rice et al. 1996). Proyecto Maya Colonial mapping and excavations identified two large ceremonial groups, domestic structures clustered around the ceremonial groups, and a defensive wall at the neck of the peninsula (Pugh 2001a). tripod dishes, collared bowls, and long-necked jars. Motifs on this pottery are those previously described for the Kowoj and are painted in red (Macanché Red-on-paste and Chompoxté Red-on-paste), red-and-black (Sacá Polychrome and Canté Polychrome), or incised (Picú Incised). In addition to the red-slipped wares, there were many Mayapán-like effigy incensarios excavated from Groups A and C (Pugh 2001a; Rice 2007). Tayasal, located on the Tayasal peninsula in Lake Petén Itzá, was occupied from the Preclasssic through the Colonial periods. According to Jones (1998), Tayasal is within the ethnohistorically defined Itza territory. 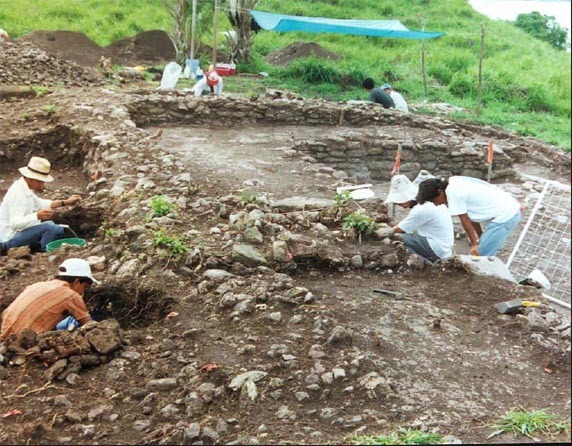 Arlen Chase’s (1979, 1983, 1985, also Chase and Chase 1983) excavations and Proyecto Maya Colonial’s remapping of the Postclassic portion of the site show that the architecture is not similar to that at Mayapán, Topoxté Island, or Zacpetén. Excavations yielded one of the red-slipped Late Postclassic wares (Snail-Inclusion Paste ware), but excavations and collections by others in the area have yielded many incensario fragments. 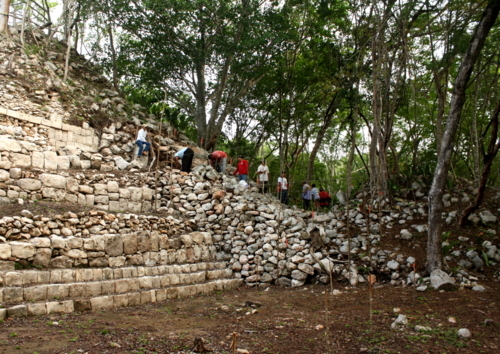 unlike that of the archaeological sites in central Petén associated with the Kowoj. Excavations yielded incensarios (Rice 1996) and red-slipped Late Postclassic pottery (Snail-Inclusion Paste ware).